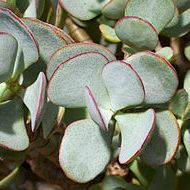 Silver dollar plant. Endemic of South Africa. Up to 4ft. high white to light pink flowers, drought tolerant. Great as a houseplant or in a container for summer.